Everyone loves this SMores Dip Recipe as a great treat that is just as yummy with far less mess than a traditional S’Mores! 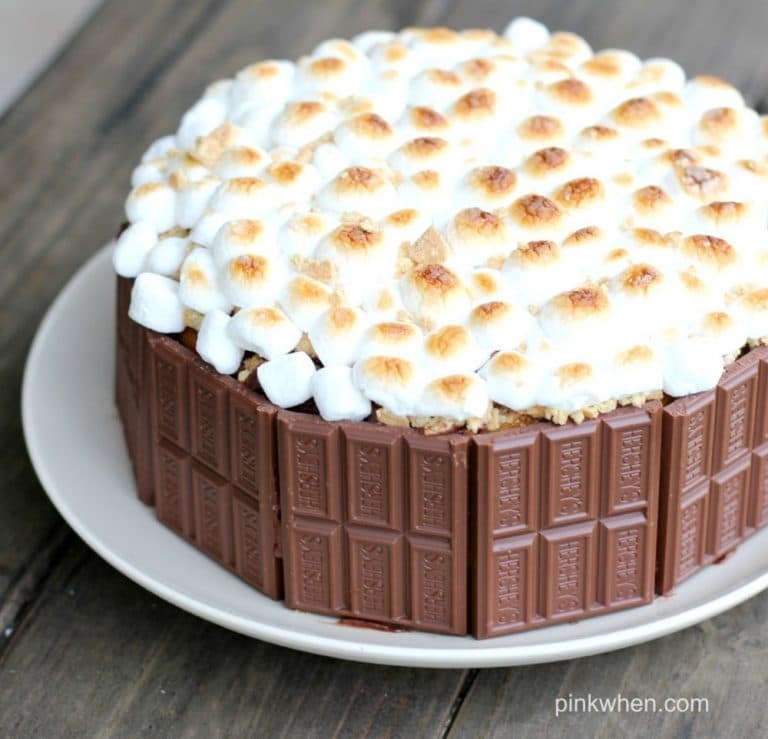 It takes Smores Dip to a whole new level! 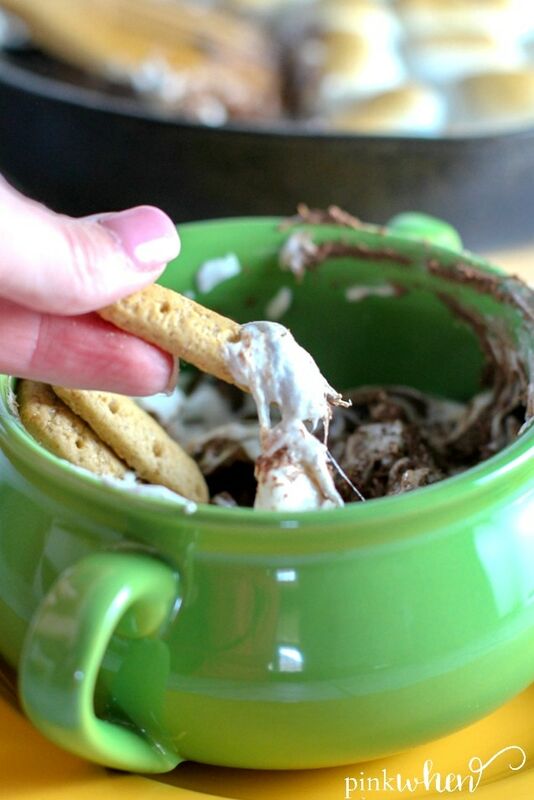 This S’mores Dip recipe is probably one of the easiest and one of my favorite recipes. You can seriously be eating this delicious dessert in just under 10 minutes from start to finish. 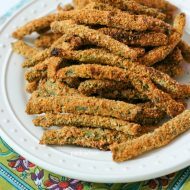 If you are looking for a quick snack that will please the masses, then look no further than here. I would have to say that one of my favorite things of all times is feeding my family and friends and seeing the look on their happy faces once they have had their fill and are content. Not sure if that is the mom in me or the people pleaser in me. But I am going to guess that it is probably the right combination of both. 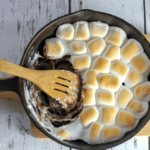 Not only that, but melted chocolate, toasted marshmallows, and a cast iron skillet are all you need to make this fantastic Smores dip. Probably the most satisfying part of the Summer is the fun little recipes I make for my friends and family. I don’t know why I make more desserts in the Summer. Maybe I have more time on my hands, or perhaps I like to cook more when the sun is shining. Either way, I probably make more desserts in the Summer because school is out and the kiddos are requesting for something to do. When I get that “what can we do?” question, I always bring them into the kitchen with me. One of the best parts about this delicious Smores dip is that it’s straightforward to make. Now I’m not allowing my 7-year-old to place things into the oven yet (just for safety reasons of this overly cautious mom), but I am letting her make her recipes. I swear this kid is going to be a cook one day. Regardless of the oven usage, this S mores dip is easy to make and a crowd pleaser. Not only that, but it’s only a handful of ingredients! Need more ideas? 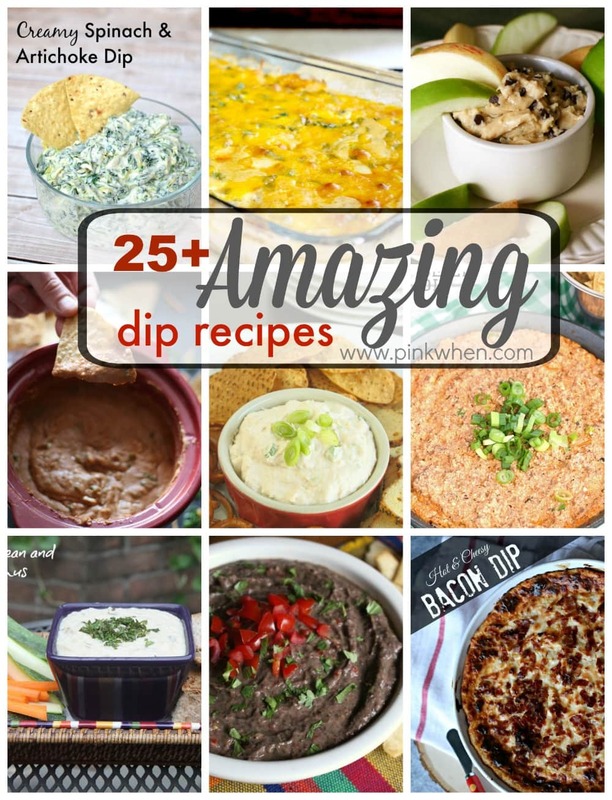 Check out these 25 Amazing Dip Recipes. 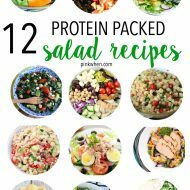 You might also like this list of 15 delicious dessert ideas, this toasted coconut pound cake, or these 25 no-bake dessert recipes. One last thing. You don’t have to make this dessert in a skillet, but I love the simplicity of adding it back to the oven and reheating it when it cools off. It’s so quick and easy. Not only that, but this makes the perfect camping dessert recipe! Just bring your skillet along to the campfire and make S’mores Dip for all of your camping buddies. Nightly campfire stores are always better with a S’mores. 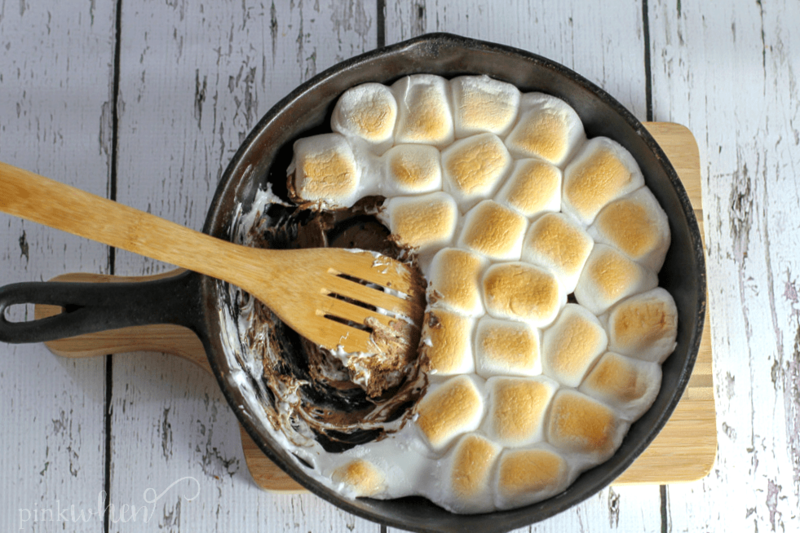 Perfect for the home or the campfire, this Skillet S'mores Dip recipe is sure to be a family favorite for years to come. 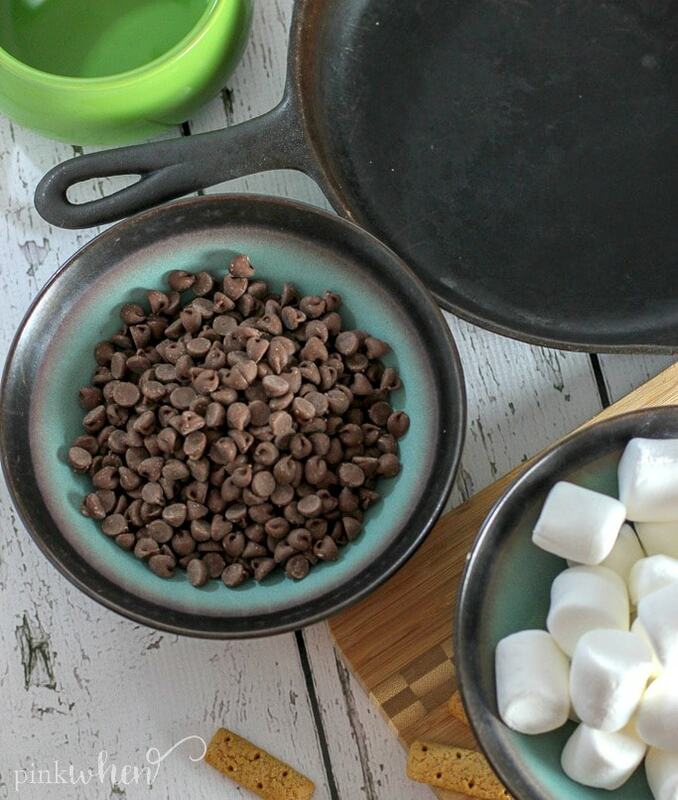 Cover the bottom of a skillet with chocolate chips. Cover the top of the chocolate chips with marshmallows. Place in oven on middle rack for 5-7 minutes, or until marshmallow topping is melted and lightly toasted. Serve warm with graham crackers. 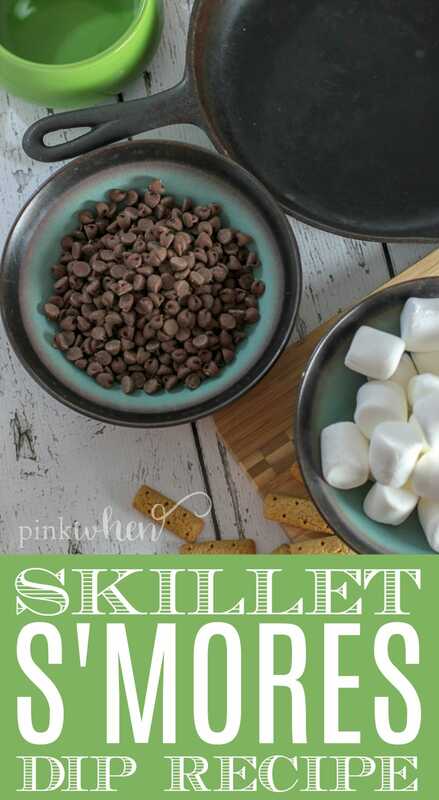 Easily add the skillet back to the oven to re-warm previously made Smores Dip. Dip with graham crackers of for a twist, use apple slices! What are your quick and easy go-to dessert recipes? 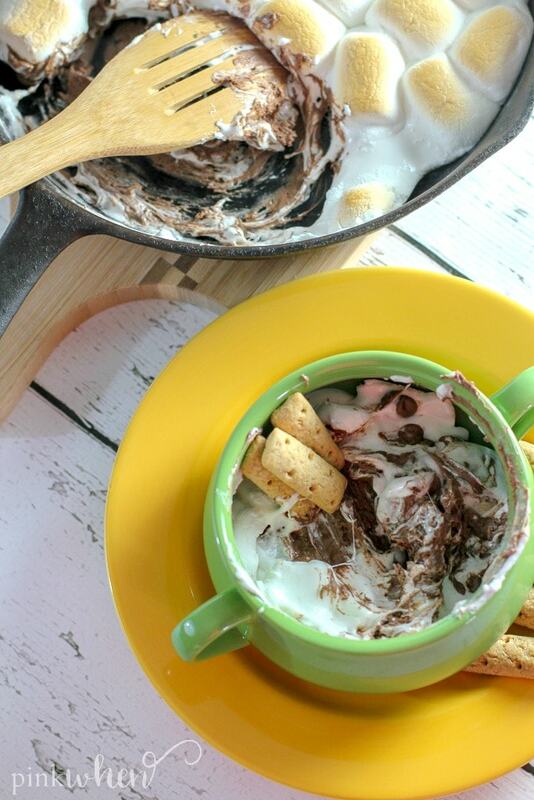 Are you planning on making this Smores Dip soon? 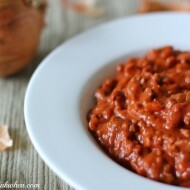 Do you have a family favorite that you love to make? Share it in the comments below!